Company Profile: Tyson Foods, Inc.
Corporate agribusiness is emerging as one of the biggest threats to America’s waterways – contributing to dead zones from the Chesapeake Bay to the Gulf of Mexico and even threatening our drinking water. While comprehensive data on Tyson’s share of factory farm and fertilizer runoff require some calculation, the company is required to report pollution from its processing plants to U.S. EPA’s Toxic Release Inventory (TRI). 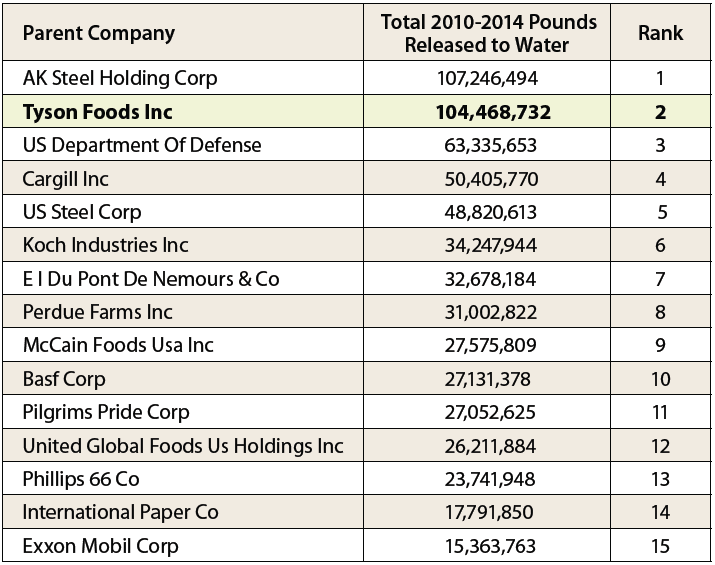 Tyson Foods Inc. and its subsidiaries dumped 104 million pounds of pollutants into waterways from 2010 to 2014 – the second highest volume of toxic discharges reported to TRI for those years.